Want to get that 1950s pin curls hairstyle? Terry Moore and Joan Evans show you how in this vintage 1950s pin curls lesson. Last month, Glamour Daze showed you how to get the hairstyles of Liz Taylor and Jane Wyman. This month, we explore the fundamentals of pin curls. It’s perfectly possible to keep you hair plumb perfect, without spending a fortune at the hair salon. All you need is to invest a little time, shampoo, pins and a hair net – oh, and a magnet ! 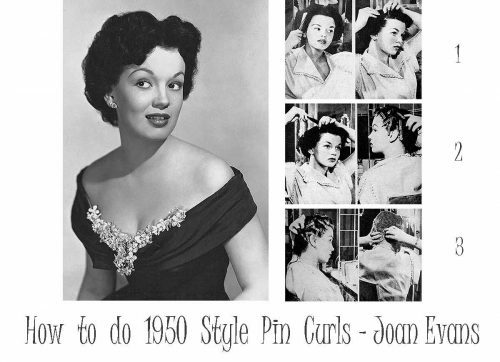 Joan Evans pin curl hairstyle illustrates the most popular type of pin curls in 1950. These are not only the easiest to do, but they are most suited to the average face and head of hair. 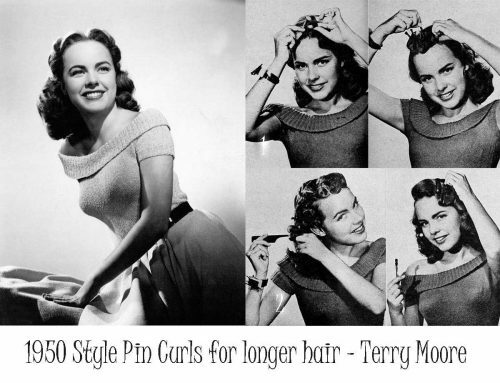 The kind of pin curls Terry Moore likes for her longer hair-do, are a little more difficult. They must be pinned so that they stand up on top of the head. First, give your hair a good brushing to stimulate the scalp. Wrap hair once around finger for tight curls, twice for loose curls. Turn each strand towards nose. Then pin tightly to the head. Curls facing face- left and right side – always turn towards nose. before pinning up back hair, make parts behind each ear. Back curls all to end in one direction -clockwise or counter-clockwise – your choice. Use hairnet to keep finished curls in place. Anchor pins down by putting net firmly over them. Fasten at the base of the skull. Finished result: Dry for an hour in the sun or 20 minutes under dryer. Brush in to shape. A lovely feminine head of curls. Turn hair on finger. Slip clip through center of curl to make it stand up and out along crown. For long back hair – wind each strand up and over finger, like a thread on a spool. Fasten these ‘spools’ with pins at either end. When hair is set, fasten down with net. After hair is dry and pins removed, use a deeper clip to set deep forward falling wave in front. Leave in for 15 minutes. Then brush hair and set in place. Finished result: A lovely head of soft curls for longer hair.